Energy sources come in many forms, including nuclear, fossil fuels like natural gas, oil and coal and renewable resources like wind and solar. 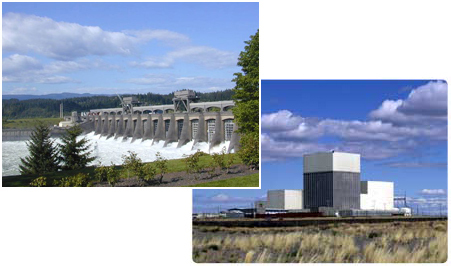 We’re fortunate in the Pacific Northwest to have abundant hydro resources to generate electricity. Hydroelectricity produces zero carbon emissions, helping us provide clean energy to homes and businesses. PenLight purchases about 90% of its power from the Bonneville Power Administration (BPA), which oversees hydro generation at 31 federal dams on the Columbia River. PenLight also receives renewable energy from its Harvest Wind project, which is located near Goldendale, WA. Harvest Wind began operating commercially after construction was completed in 2009. The Harvest Wind project has 43 turbines that collectively generate enough renewable power for over 23,000 homes. To learn more about the Harvest Wind project, please click here: Harvest Wind. Peninsula Light Company must annually report our electricity sources to the Dept. of Commerce, which in turn combines all utility data into a utility report for us to share with our members in the form of a Fuel Mixture Report. Utilities are required to report their annual fuel mixture information by generation category. PenLight is proud to report that 83% of wholesale electricity purchased in 2017 comes from hydropower. Wind power, a qualifying renewable energy source under the Washington State Energy Independence Act (Initiative 937), makes up 7% of the fuel mix. The 2017 report further reflects that 8% of the electricity comes from the Columbia Generating Station, the nuclear power plant in south-central Washington. Only 2% of our power comes from fossil fuels. Below is PenLight’s fuel mixture for 2017. Washington’s Energy Independence Act (I-937) requires each qualifying utility to annually report its progress as it meets established conservation and renewable energy targets. The first reporting year was 2012, which covered conservation efforts in 2010–11 and renewable energy targets for 2012. PenLight submitted its most recent report to the State Department of Commerce on May 31 of this year, which reflects our conservation achievements for the to date as well as our renewable energy target for the upcoming period. The conservation report summarizes the energy efficiency PenLight achieved through the programs it promoted to its members. Upgrades included installation of high-efficiency heat pumps and water heaters, duct sealing, and residential and commercial lighting improvements, as well as improvements to commercial building heating and cooling systems and refrigeration controls. The renewable energy report summarizes the renewable energy resources PenLight acquired to meet its renewable energy target. PenLight utilized Renewable Energy Credits (RECs) from regional wind projects, including Harvest Wind, to meet those requirements. PenLight is required to submit a Resource Plan every two years to the state Department of Commerce (DOC). The plan forecasts PenLight’s loads for the next five and 10 years, and it also describes the resources it plans to use to serve those loads. Our 2018 Resource Plan was submitted to the DOC in September. The objective of this report is to describe the results of PenLight’s 2017 Conservation Potential Assessment (CPA), which estimates energy savings available by sector for the time period 2016–2035, with an emphasis on the 10-year period of 2018-2027. The assessment considered a wide range of conservation resources that are reliable, available and cost‐effective within the 20‐year time horizon. The conservation measures are based on the Northwest Power and Conservation Council’s Seventh Power Plan, and the methodologies used are consistent with the Council’s methods. The results provide energy savings estimates that will assist PenLight in its future resource and energy-efficiency program planning.